← Oh Flood Reds Wherefore Art Thou? Would someone please queue the Queen track? It seems luck wasn’t on my side today. A small group of us hit Dutton Island in search of reds but didn’t end up doing too well. There were some dink trout and rays caught but that’s about it other than a rat red. My buddy and I were after the same hole (where he ended up catching the rat) when my day went south. I’d been fishing for about an hour using the Mangrove. I’d also picked up a Rio Outbound Short line that I’d loaded up on the BVK to get into some deeper holes. I had the BVK out and decided to go back to the Mangrove. I made a back cast and as I made the forward cast the end of my new rod went flying. For a moment I thought that after breaking the BVK perhaps I was a little too timid while putting the sections together. I pulled the line in and retrieved the section which made me happy. The way things had been going I figured the fly would be gone and the section would’ve slid right off the line. 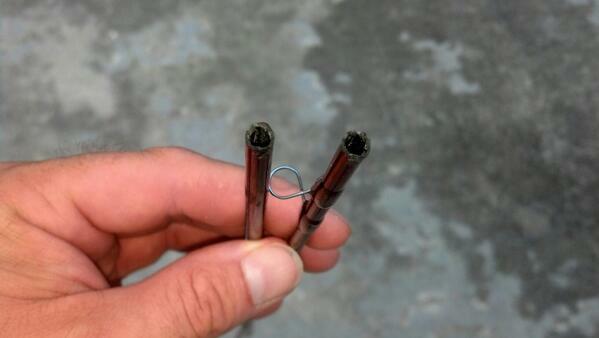 When I got the end of my rod back in the boat I noticed that it hadn’t come apart. It had snapped right in the middle of the section! While I’ve managed to break two TFO rods in the span of a month, I have to say that their service has been superb. The Mangrove was delivered to their door on Friday and I had it back on Wed. Let’s just hope I can keep them both intact for a while. This entry was posted in gear and tagged mangrove, tfo. Bookmark the permalink. I did almost the exact thing with my Ross 8wt. Sent it in and they sent me a new one. Only mine snagged on oysters and I thought it was a fish… Set the hook and snap! Forgot to strip strike! 🙂 I’m an awesome oyster angler.